I make the cultural mistakes… so you don't have to. 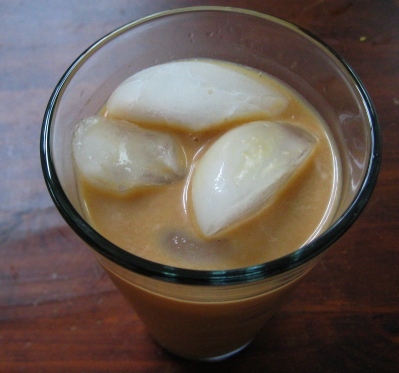 Iced coffee – It’s probably not what you think it is. It was a beautiful warm summer day in Nice, France and my friend and I wanted a coffee before wandering down to the beach for the afternoon. Considering how touristy Nice is, and how frequently I would be answered in English when ordering in French, we must have found the only cafe in Nice where no one spoke English. I perused the list of available coffees and decided on one of the first ones. I figured, if I’m here, I’ll just drink what the locals do. The barista looked at us with a baffled look on his face. He then proceeded to explain in swift French what a Café Glacé is in his experience. It sounded complex, as I couldn’t understand all of it. Possibly involving a liqueur. That wasn’t what my friend wanted, so we changed his order to just a normal coffee. We were served promptly and went to sit at a table and enjoy our beverages. A few minutes later, the barista appeared by our table bearing a shot glass full of a caffeinated substance. ‘Café Glacé!’ he declared, placing it down on the table with a flourish. He asked us to try it and gave us a very French wink. My friend and I gingerly sipped the beverage. It was cold, tasty, coffee-flavoured, but also with a sweetness that must have come from ice cream or liqueur, maybe condensed milk, possibly a combination. Certainly not coffee with ice, as we had been expecting. Espresso shot plus flavouring (ice cream/ liqueur / condensed milk, perhaps?). Large parfait glass filled with espresso, milk, a scoop of ice cream, and possibly whipped cream and or coffee powder on top. Drip coffee with copious amounts of ice, served in a large cup. Espresso with ice, or virtually frozen. Wikipedia suggests many other variations. Apparently just about every country has its own version. Who knows what you’ll get anywhere. I’m just glad we didn’t get snubbed for wanting inappropriate coffee like this person. This entry was posted in Coffee, Drink, Food, France, Language difficulties, Travel and tagged coffee, france, iced coffee by Alicja. Bookmark the permalink.